To help with our environment, some Volkswagen TDI models are now fitted with AdBlue® advanced emissions control equipment that cleans exhaust gases to comply with the new EU6 exhaust emissions regulations. AdBlue® is a non-toxic, non-flammable; biodegradable urea and water-based liquid additive that processes the gases in a car exhaust system to remove harmful nitrogen oxide (NOx) emissions. 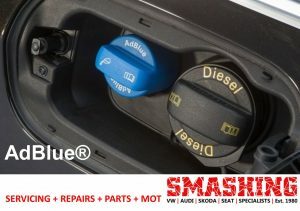 On average, a car consumes around 1.0 – 1.5 litres of Adblue every 620 miles, dependent on model and driving style and needs to be topped up at the required times. You will be notified when a top up is required by the when a warning light is illuminated. 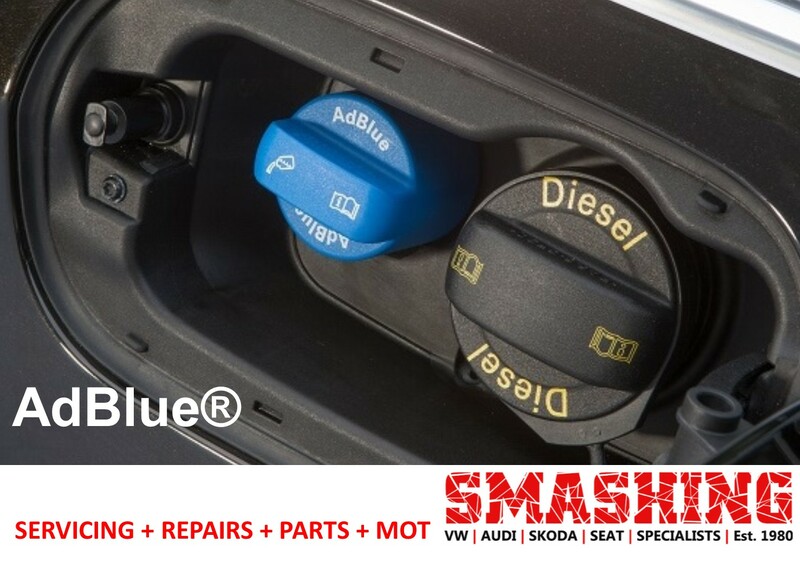 Our technicians are fully trained to handle AdBlue® and we top up with specifically-designed adaptors to ensure there are no spillages that could damage your car. AdBlue® top-ups are charged by the litre, so you only pay for the amount you need. After using the VW main dealer and other local VW specialists in Leeds with just average results. I was recommended Smashing by a friend and have been delighted by the honest pricing and quality service. Highly recommended. Seen more of them than my wife over the last few weeks! Sorted my golf out no problem. Nothing is too much trouble, brilliant service from start to finish. Rick In particular was very helpful, explained everything really well and most importantly honest people. Carried out the work needed and kept me well informed. Cheers chaps. Will definitely be back. Not too soon though hopefully! Very efficient staff, a great improvement in performance and fuel economy. Thanks to all. Vag specialists, Rick the owner and the guys down there really know there stuff always found them very professional and most importantly very honest. Only place I would take vw/audi in leeds. Phoned these guys up a few weeks ago and spoke to a chap that was very helpful. Will definitely be using them in the future.